Rochester & Carter 4 barrel fuel inlet spring. This spring resides behind the filter. 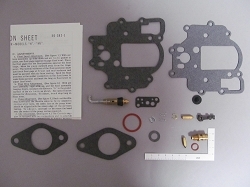 Used on Rochester 4G & 4GC, Quadrajet carburetors, Carter WCFB. ID .535" Length .940" Wire Diam. 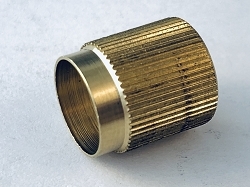 .025"
Excellent quality and replaces the original (hard-to-find) part perfectly. Just needed a few springs for the Q-jets I have. Looks to be decent quality. spring worked out perfect....great price too. 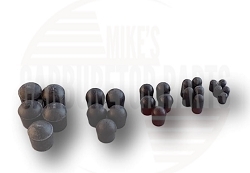 Mike was helpful in identifying another part that would work for me.His store will be the one I contact for parts. Q: I'm looking for a Fuel Filter Spring and Inlet Nut Nylon Gasket for a M4MED Carburetor. 1985 GMC 1/2 ton 2WD PU 4.3 V-6 Engine VIN 2GTCC14NOF1522964 Do you have these parts? Thank you. Q: my quadrejet 4bbl doesnt have the fuel filter spring, do i need one for mine? whats the purpuse of the spring? 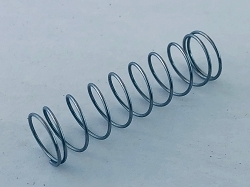 Q: Not sure if this is the spring I need? Is this the needle valve spring (part of the float valve system) that allows fuel to flow into the bowl? Also shuts fuel inlet off. If not educate me as to what I need. Q: Hi took carburetor and fuel filter off. Where does this Fuel filter spring go on chevey 4 brl V8 5.0L Small block?